About 2 years ago, I began to faithfully fulfill this minimal obligation. 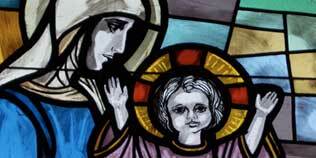 Prior to that, I did attend mass frequently, but if I missed every now and then, it was OK with me. In fact, I used to volunteer to stay home with the twins when they were much younger so that my wife and oldest daughter could go to mass in peace. Wasn’t that nice of me? Anyway, it wasn’t that I hated going to mass, I just didn’t “enjoy” myself. I was like many who believed that the mass was about me and my needs rather than an opportunity to “commemorate the resurrection of the Lord.” If I wasn’t entertained or didn’t “get anything out of it,” I didn’t see the point in attending. However, thanks to several blessings, not the least of which is the example shown by my wife, I rediscovered the true meaning of the mass and don’t miss a Sunday, even on vacation. I even sacrificed by attending an evening mass once at a neighboring parish which has a showy band for its music. I really don’t like it when I attend a mass and a rock concert breaks out. But that is a topic for another time. Weekly mass has become, for me, an opportunity to worship our Lord and receive the gift of the Eucharist. I now get as much from the weekly mass as I put into it and it is such a blessing to attend every week. After I started to understand the mass and all its gifts, I would occasionally attend a weekday mass at either St. Francis de Sales in Lebanon or at St. Peter in Chains Cathedral in downtown Cincinnati, close to my office at UC. I actually made my first confession in 30 years to a priest at the Cathedral so it will always have a special place in my heart. I attended daily mass when the mood struck me but with no consistency or compelling urge to do so. However, just over 9 weeks ago I looked at my calendar for the week and saw two glorious things. First, my boss was out of town all week. Second, because she was out of town, all my morning meetings were cancelled. I decided on the spur of the moment that I would attend daily mass every day that week and see how I liked it. During that week I attended the 7 a.m. mass at St. Gertrude church in Madeira. I was surprised by how many people were at mass. There were probably over 30 people every day, mostly the same ones day after day. The next week, I decided to continue morning mass but was challenged one day with a meeting away from my office that interfered with 7 a.m. mass. Using www.masstimes.org, I found a church near my meeting location that had a 6:30 a.m. mass. I went there instead that day and returned to St. Gertrude for the rest of the week. I next found that I could still get to mass before a 7 a.m. meeting if I went to 6 a.m. mass at St. Xavier in downtown Cincinnati. I figured, “what kind of nut goes to 6 a.m. mass in the middle of the week?” Evidently, there are about 25-35 nuts who get up that early every day and I had become one of them. After I figured out that I could leave my house by 6:15 every day and still get to the Cathedral before 7 a.m., I have consistently attended mass there along with the same 20-25 people. There is the women who reads the entrance and communion antiphons every day. There is the guy who always comes in with his backpack and the lady with her rustling Wal-Mart bags. There is the woman who wears a mantilla, sits right up front and, for some reason, holds a small doll throughout the mass. They are all there, every day, worshipping God through the mass. There are all kinds of ways to build your relationship with God. I have found that attending daily mass has brought me closer to Him and is a great way to start my day. Try it for a week and let me know what you think. Some folks may call them mere coincidences or concurrences. I won’t deny coincidences may happen but, the more of these unexplained situations I observe, I believe there is more to them than their being random occurrences of chance. Sometimes they may have elements of Divine Providence that are intended to guide us, and sometimes they are simply gentle reminders that He is here. Sometimes they are profound experiences that hit you up-side the head, and sometimes they are subtle inspirations that leave you wondering if He is having a nice belly laugh at our expense. I think I got a dose of all of these this last weekend. My wife and I drove our youngest daughter from our home in Ohio to Knoxville, Tennessee on Saturday morning for a campus visit and open house at the University of Tennessee. She’s a senior and trying to decide what field of study to pursue and at which university she would prefer to continue her education. After a four hour drive and four hours of walking the UT campus we hopped back in the car and headed southwest towards Starkville, Mississippi for a tour at Mississippi State University on Monday. In setting up this trip I knew it would be a long day on Saturday and considered where to spend Saturday night. Finally, checking distances and reasonable times of arrival, I settled on something in Birmingham, Alabama. I prefer to stay at hotels in one particular family of hotels and so, when I got on-line to check for accommodations, I found over a dozen possibilities in the Birmingham area. As an afterthought, it occurred to me that the parents of my future son-in-law (fiancé of my second oldest daughter), whose parents we had not yet met, lived on the south side of Birmingham. So, I selected a hotel near the interstate just south of downtown in hopes that we could perhaps meet up with them (which we actually had the pleasure of doing). We wanted to attend Mass on Sunday morning, 15 September, so I logged onto masstimes.org to find a church near us. 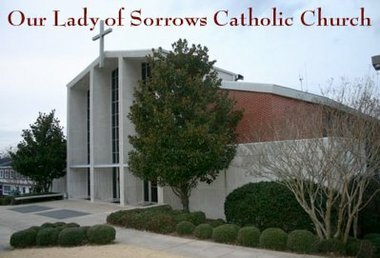 There were a half dozen or so not too far away but we chose Our Lady of Sorrows in Homewood, Alabama, that had an 8:30 a.m. Mass which would be convenient to our schedule. It was close to Samford University where we thought we might mosey around after Mass and still give us time to meet up with my future son-in-law’s parents. A friend and follower commented in Bolo Ties, Rosaries and Rainbows , “My blessed mother, God rest her soul, always said that you get special blessings when you visit a church for the first time.” After visiting Our Lady of Sorrows, I’m thinking my friend’s mother knew what she was talking about. I’d love to hear your thoughts and any special “God Moments” you might want to share. I wish I could remember from whom I heard that adage some thirty plus years ago. It had to have been a wise old man who’s long gone by now. It’s the way I felt today, like the blind hog finding a wonderful acorn. For seven years I have been traveling once or twice a month to a satellite office just south of Somerset, Ohio (ESE of Columbus about an hour). And each of those 100 or so times I have traveled the same route to and from that office. But, this morning there was construction on Highway 22 going east into Somerset so I decided to take a different route coming home. Instead of turning left out of the gate I turned right and, like in Robert Frost’s poem, The Road Not Taken, “I took the one less traveled by, and that has made all the difference.” I popped over the first hill only about a half mile from my office and approached the intersection with OH Rte. 383. I looked to my right to see if any traffic was approaching when I saw, towering over a clump of trees, a tall church tower. It appeared old and was constructed of red brick. Interested, I turned right instead of left, and drove the few hundred yards to where I could get a better view. The church sat back from the road about 200 yards and was perched on a rather high knoll with a winding driveway up to the church. Next to the highway was a graveled area in front of the tree covered hill leading up to the church with a sign proclaiming this to be St. Joseph’s Church, the oldest Catholic Church in Ohio, Founded 1818. 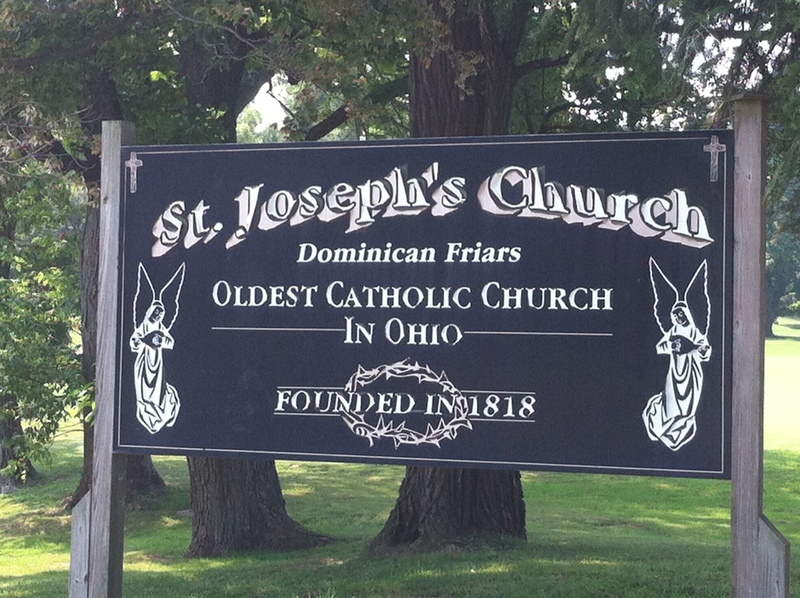 St. Joseph Church, “Cradle of the Faith in Ohio”, was the first Catholic Church in the state. Dominican Father, Edward Fenwick, later the first bishop of Cincinnati, came from Kentucky to visit local Catholics for the first time in 1808. Led by Jacob Dittoe, six Catholic families bought this half section of land and built an 18 by 22 foot log church. Dittoe deeded the 320 acres to Fenwick, who blessed the church on December 6, 1818. 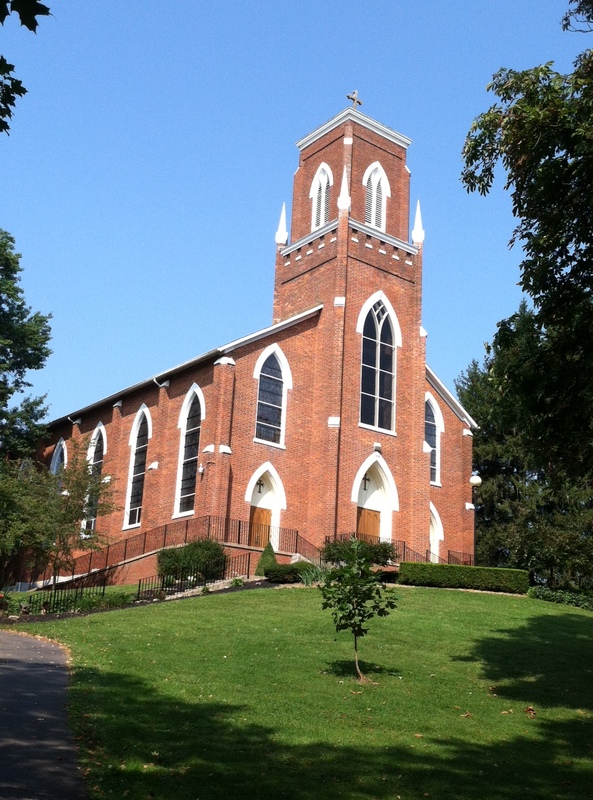 Located near Zane’s Trace, the church attracted German, Irish and Alsatia Catholic settlers and became the mission center for southern and central Ohio. The present structure, the third on the site, was dedicated in 1843 and rebuilt in 1866 after an 1864 fire. Here was this beautiful church, sitting on a tree covered hill surrounded by nothing but corn fields, with the hamlet of Somerset being the nearest cluster of civilization about six miles to the north. I felt as though I had just unearthed a lost treasure. I was intrigued. 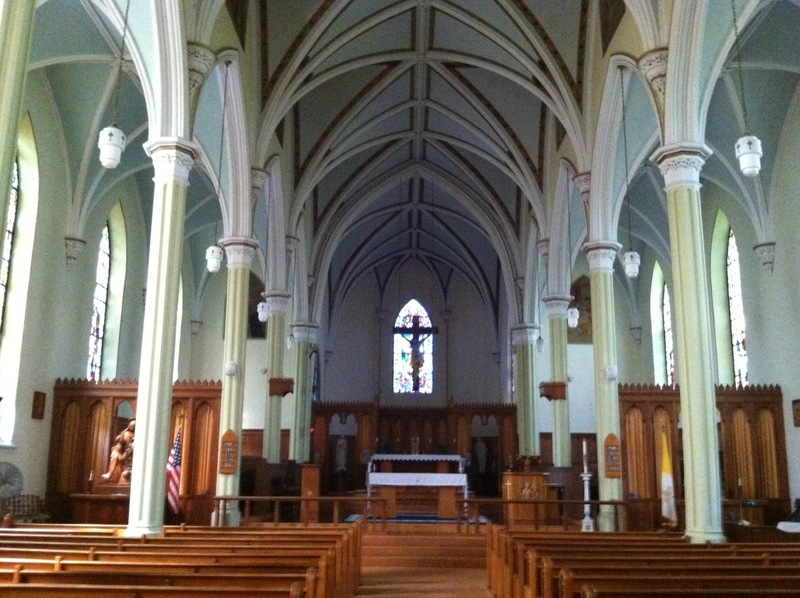 I love old churches and I needed to see if St. Joseph’s was open for a look-see inside. I pulled up into a circle drive at the foot of a long flight of stairs to the front door and parked. After climbing the stairs I was actually surprised to find the huge wooden front door slightly ajar. With anticipation I pulled the door open and poked my head inside. It was beautiful! Painted vaulted ceilings supported by huge pillars extended the full length from front to back. Beautiful, intricate stained glass windows lined both sides of the church. There were about twenty pews per side, each of which would sit about eight to ten worshipers. A huge pipe organ graced the loft in the back of the church over the entrance. All the pews were solid oak (no veneer in this place!) as was the hardwood floor and the altar, chairs, ambo, and carved, arched screens on either side of the altar separating the choir areas. And, I had it all to myself. Today is Tuesday. To put what happened next into context, let me back up and describe what’s been going on in my life the last few days. Last Thursday I had knee surgery so I was off work on Friday. I took that opportunity to post Finding Grace through Eucharistic Adoration. 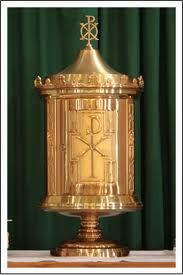 On Saturday morning I went to Mass and did my hour of Adoration with the Eucharist exposed. On Sunday after Mass, I had brunch with Fr. Sean Davidson who has been visiting our parish to help us establish Perpetual Eucharistic Adoration. On Monday evening, I attended a meeting to organize those same efforts, again with Fr. Sean. So, it was no surprise for me, then, upon finding myself alone in this magnificent old historical church, to decide to spend my lunch hour in Eucharistic Adoration. The bronze tabernacle was in its place behind the altar and the red candle was burning signifying the Blessed Host was in its home. I took a seat in the front pew on Mary’s side such that I could kneel on my left knee and still be able to keep my right leg extended. It was so quiet. Aside from the constant tinnitus in my ears and my own breathing, there was total silence. If there was any traffic on the highway, I was far enough off the road not to hear it. Once or twice I heard the old structure creak. It was just me and Jesus. I gave thanks and prayed for His help. 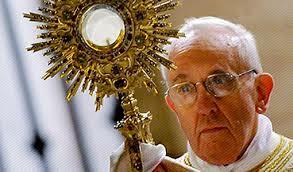 I prayed for grace for our parish in our efforts to establish Eucharistic Adoration. I prayed for my family, for friends who are struggling, for the unborn and new parents to be, for peace in the Middle East and for guidance to our nation’s, and other nations’, leaders with respect to the looming conflict escalation in Syria, for peace and comfort to all those who remember and were affected by the tragedy in New York City twelve years ago tomorrow. I didn’t have my bible but I had my cell phone so I called up my app and read today’s readings from Colossians (Col 2:6-15) and Luke (Lk 6:12-19) and meditated on them. I had never read Colossians before so I read all four chapters. And then I just sat there in silence and listened and experienced the peace and solitude of being in the presence of Christ. It was a beautiful thing. In the hour and ten minutes I was there I didn’t see or hear another soul.